KARACHI: Department of Psychology, University of Karachi (KU), organised a campaign entitled ‘Awareness walk on cleanliness’ at the university premises on Thursday. 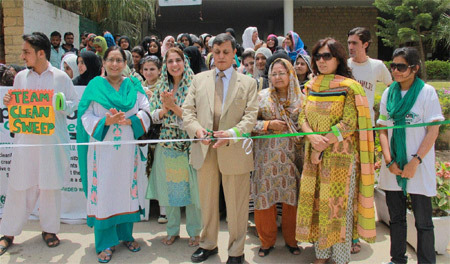 Dean Faculty of Arts Prof Dr Zafar Iqbal inaugurated the campaign through ribbon cutting along with chairperson of Psychology Department Rubina Feroz. Many teachers and students were also present. The project was initiated under the course of social psychology. As per details, students placed dustbins at various places in the premises of the varsity and in this noble cause, some organisations also sponsored. In campaign, they placed 20 permanent and 10 non-permanent dustbins. Dean Arts walked along with students to raise awareness of cleanliness with students dressed in white and green with arms bands on their hands to show their support for this cause. Talking to Daily Times, Dr Zafar Iqbal said, “This type of work leaves positive impact on society and this type of campaign should continue in future.” Students placed trash bins for awareness among people and students about importance of cleanness, he said. Dr Iqbal said that joint activities help get big targets so teachers, parents and others should create awareness among their kids about the importance of cleanness. A volunteer of the walk, Irfah Zafar, said, “She is very happy to be a part of this beautiful event because it helps create our society eye-catching.” She further said that all other students should also play their role in this kind of event so that our country could be bright.